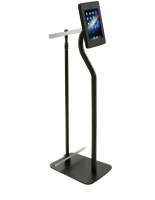 These iPad display stands, also called tablet kiosks, come paired with a number of visual marketing tools. Using Apple® or Android touchscreens to engage the viewer opens up a whole new world for convention goers and retail shoppers. 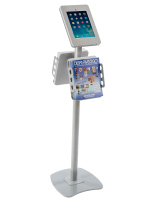 Our iPad display stands offer a multi-faceted way to attract an audience. Large poster or banner graphics can be seen a long way away. 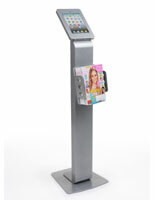 When the viewer approaches the floor stand, they can interact with a program or app to learn about your product or company. Lastly, they can grab takeaway literature that reinforces your brand or new product line for the future. 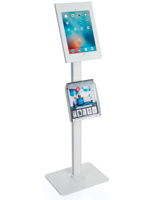 What kinds of features come with these tablet kiosks? 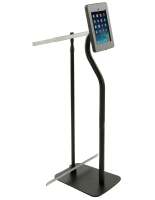 The iPad display stands all have locking, secure enclosures for your tablet. These enclosures also hide the home button so viewers only remain on the home screen. 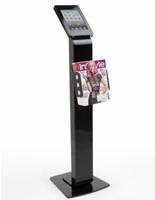 A few models have brochure holders that can accommodate folded pamphlets or full-size magazines and catalogs. 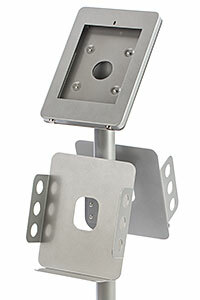 These are situated conveniently right beneath the iPad mount. 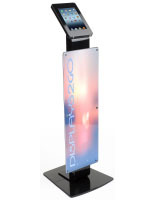 Some floor stands feature poster frames sized for your 18" x 24" graphics. 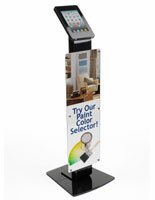 The styles that display vinyl banners are custom-printed by us. 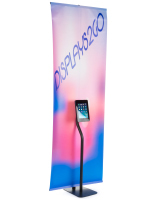 Think of these displays as you would of banner stands, the workhorse of trade shows or any other promotional campaign. The important distinction is these banners are paired with tablets and literature! 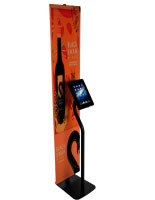 Trade show exhibitors need enticing ways to attract attendees. Promotional items are usually given away as souvenirs but the nuts and bolts of any business strategy has to be the distribution of their product and/or company literature. The idea of branding is extremely important, especially to growing companies so incorporating a digital/visual experience further reinforces your intent with potential customers. 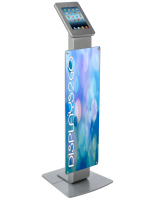 However, these touchscreen holders are by no means limited to the trade show experience. 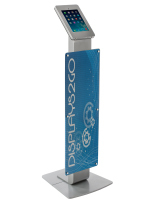 Tons of retailers like to set up digital displays with their catalogs, while others use the floor stands to augment merchandising lines or to provide specs for new products. All information is at the customer's fingertips with a simple swipe of a finger!